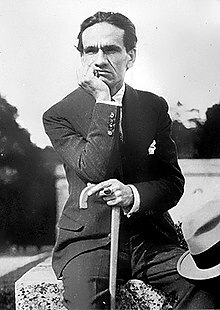 César Abraham Vallejo Mendoza (March 16, 1892 – April 15, 1938) was a Peruvian poet. Although he published only three books of poetry during his lifetime, he is considered one of the great poetic innovators of the 20th century in any language. Los intelectuales son rebeldes, pero no revolucionarios. Intellectuals are rebels, not revolutionaries. El puro y desadaptado que choca con el mundo de las farsas y de las apañucias. The pure and poorly adapted one who crashed against the world of fakes and cheats. La mecánica es un medio o disciplina para pealizar la vida, pero no es la vida misma. Esa debe llevarnos a la vida misma, que está en el juego de sentimentos o sea en la sensibilidad. Mechanics is a means or discipline for the realization of life, but not life itself. It ought to carry us to life itself. The arts (painting, poetry, etc.) are not just these. Eating, drinking, walking are also arts; every act is an art. This page was last edited on 8 September 2018, at 00:24.